^ Milton Orchin,Roger S. Macomber, Allan Pinhas, and R. Marshall Wilson(2005)"Atomic Orbital Theory"
^ Daintith, J. Oxford Dictionary of Chemistry. New York: Oxford University Press. 2004. ISBN 0-19-860918-3. ^ Nagaoka, Hantaro. Kinetics of a System of Particles illustrating the Line and the Band Spectrum and the Phenomena of Radioactivity. Philosophical Magazine. May 1904, 7: 445–455. ^ Bohr, Niels. On the Constitution of Atoms and Molecules. Philosophical Magazine. 1913, 26 (1): 476. ^ Bryson, Bill. A Short History of Nearly Everything. Broadway Books. 2003: 141–143. ISBN 0-7679-0818-X. 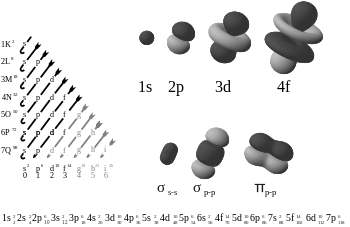 ^ Mulliken, Robert S. Electronic Structures of Polyatomic Molecules and Valence. II. General Considerations. Phys. Rev. July 1932, 41 (1): 49–71. doi:10.1103/PhysRev.41.49. ^ Griffiths, David. Introduction to Quantum Mechanics. Prentice Hall. 1995: 190–191. ISBN 0-13-124405-1. ^ Levine, Ira. Quantum Chemistry 5. Prentice Hall. 2000: 144–145. ISBN 0-13-685512-1.